Gov. 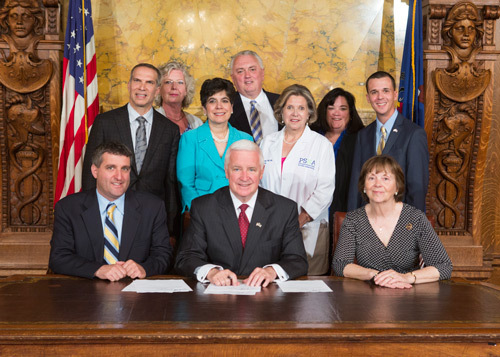 Tom Corbett ceremonially signed into law Rep. Frank Farry’s (R-Bucks) Indoor Tanning Regulation Act. The bill, now Act 41, prevents teens age 16 years of age and younger from indoor tanning facilities, and requires parental consent for 17-year olds. Additionally, Farry’s legislation requires every tanning facility in Pennsylvania to register with the state and necessitates inspections and safety standards for the industry. Joining Farry and Corbett in the photo are representatives from the Pennsylvania Academy of Dermatology and Dermatologic Surgery, Pennsylvania State Nurses’ Association and the Pennsylvania Department of Health.